Nearly every teen has acne to some degree but early treatment can help keep your child's acne to a minimum. Learn about five things you can do to help keep your young teen's skin healthy and clear mild acne breakouts before it can progress. Teen acne typically begins between the ages of 10 to 13, with many children showing beginning signs of acne as early as age 8. This is probably a lot earlier than you would expect. Watch for small blackheads and early papules, especially on the nose where acne usually starts. As acne worsens, it spreads to the forehead, then cheeks and chin. The goal should be to catch breakouts early before they begin to spread. Start treatment as soon as mild comedones appear. Don't use the wait-and-see-if-it-gets-better approach. It won't get better on its own, and the sooner you begin treatment the better the results will be. Beginning around age 9, children should start cleansing their faces every night with a gentle cleanser such as Dove or Neutrogena. Many times this alone will help improve mild pore blockages. Daily facial cleansing is especially important for boys, as they tend to develop more severe and longer lasting acne. If you're noticing pimples, have your child use a benzoyl peroxide or salicylic acid cleanser once or twice a day. If the cleanser dries your child's face, lightly apply an oil-free, fragrance-free moisturizer after every cleansing. Choose very mild products. Your child's skin is sensitive, and harsh products can irritate the skin. Don't encourage scrubbing. Scrubbing won't clear acne but can irritate the skin. Apply a thin layer of benzoyl peroxide cream over all affected areas once or twice daily after cleansing. Monitor your child's face for redness, irritation, or excessive dryness. If they occur, scale back use to every other day. Teach your child not to pick at or "pop" pimples. Doing so can force infected material deeper into the skin, making the pimple flare even more. Picking at a pimple can cause scarring, exacerbate inflammation, and generally makes acne worse. It can also lead to a serious infection. Young teens, in particular, seem determined to pick at their skin. They may need gentle reminders to encourage them to keep their hands away from their face. Explain that popping pimples can aggravate acne, making pimples look more red and obvious, and causing more breakouts. 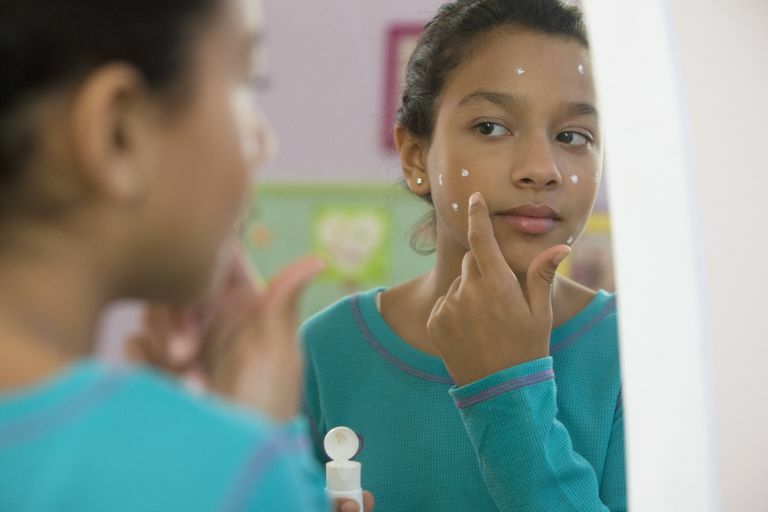 If your kid's acne isn't improving with home treatment, or if your child seems upset about his skin, your next step should be to see a dermatologist. Your dermatologist can help create a treatment plan that will help your child. Again, don't wait to seek treatment. The sooner you begin treating acne, the easier it is to control. Your​ child may be reluctant to talk about his skin problems, especially if he feels self-conscious about his breakouts. Try not to nag about your child's skin and, above all, be supportive. Your teen may actually thank you.